Quick! Can you think of your staple party food that you always make when hosting or bringing a dish to a get together? Well, this creamy chicken dip has been that food for me and my immediate family. My mom knows that there will be quite a ruckus at our family gatherings if this dip isn’t immediately presented when we walk in the door. It’s SO good and really easy to make (which is another reason I personally like it). We actually call this dip “chicken ball” in my family because the original recipe said to serve it in a ball shape, and we just thought it was a funny visual. But you don’t have to call it by that name (unless you want to…). Either name you choose, it’s still delicious! Drain the white meat chicken and add the meat to the 2 cans of chicken spread in a large bowl. Stir in the softened cream cheese and mix together until combined. Add in the soy sauce, mayo, and parsley. Chill in the fridge for a few hours before serving. This looks so delicious. And I love the idea of using the cucumbers! Is it weird that I got really excited when I saw we use the same soy sauce??? These look SO good! So refreshing for summer! 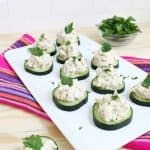 Those look great, and a much healthier bite with cucumber. This looks really good! I usually put tuna onto of little cucumber slices but this is a great idea! This looks so tasty! About how many servings will this recipe make? Thanks! YUM! This sounds so delicious. Definitely have to try it next time we have friends over! This looks so good! I never thought about mixing chicken with cream cheese…2 of my favorite things! Sounds just as good as described- love the ease of prep too! Wait..Canned chicken exists? Just in usa or elsewhere too?! Never knew that.. They look good, I thought they where tuna. Mmmm, this looks so delicious and fresh! I love how simple it is. Soy sauce? Sound interesting! Will have to try for sure! As long as there is cream cheese, I am in! You can even save some cucumbers and do a quick eye facial! This looks really delicious! I’m a big fan of all these ingredients so it definitely sounds like something I would like. Perfect for the summertime! These sound great and look so fun for a party food! My creativity is always pushed, I love this blog so much for that exact reason! Yum! That looks delicious! I can’t wait to try it! The best! I made this for a baby-shower this weekend and it was AMAZING! It will be my new go-to party food and it was good the next day for lunch, thanks for posting. What’s the Number of servings for your Salmon Mouse and Chicken Dip?